Oldland Abbotonians AFC and Bitton AFC have for a long time supplied local supporters with a high level of amateur football and most recently semi professional standard in the Western league. Both teams have worked their way through the league levels. Oldand Abbotonians , originally St Annes Oldland, founded in 1910, nicknamed ‘The Os’, played at Pit Bank near California Pit, changing in the Greyhound pub on West Street. 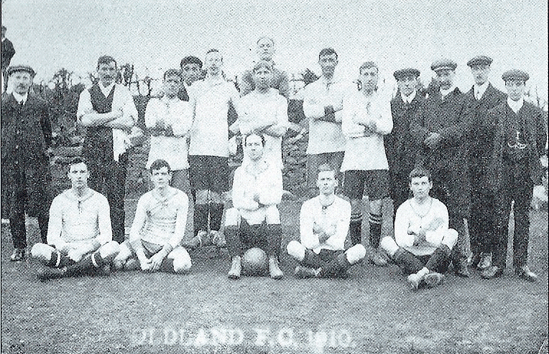 The restart of football after the Great War led to honors for Oldland when the team won the GFA Minor cup in the 1921/22 season and in 1925 the GFA junior cup. 1962 saw Oldland as one of the founder members of the Bristol Premier Combination League and in 1973 were promoted to the Gloucester County, winning the GFA senior amateur cup, then in 1986 re-elected as Oldland Decora. Under chairman Alan Bush 1998 saw the merger with Abbotonians at the Castle road ground in the Somerset league and then the Western league. More recent success includes Somerset Senior Division 1 winners 2004/5, Premier League runners up 2005/6 and promotion to the Toolstation League in 2006/7. Throughout the years many individuals have been important to the success of the team on and off the pitch. 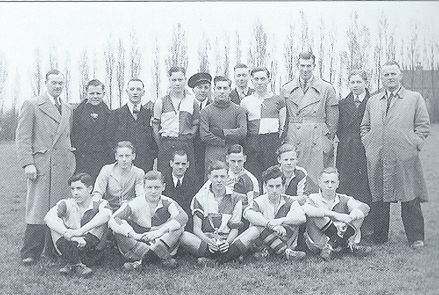 Some of the more familiar names include Reg Hamblin, who first played in 1952 and went on working for the team in administration and ex players Vic Lambden, Peter Sampson, Brian Bush and Mike Tippets who all progressed into the professional game with Bristol Rovers. David Noble’s book ‘As Time Goes By’ shows excellent photos of Oldland’s 1976/77 senior cup winning team and the Oldland St Annes’ 1921/22 team, including such players as W Hunt, J Anstey and R Mortimor. The addition of floodlights in 2011 to the Oldland ground furthered their establishment as an ambitious team, which also runs Reserve, Ladies and Youth teams. League rivals Bitton were founded in 1892, although little is known of this period. The team formation we know today was founded in 1922, playing during the 1930s in the District league, sporting their yellow and black-hooped shirts. The strip was changed in the mid thirties to red and white strips after the chairman’s, Johnathan Crowe, admiration for Athletico Madrid. Bitton originally nicknamed ‘The Ton’ became known as ‘The Boyds’ after a celebratory plunge in the local river by the same said Johnathan Crowe , after a good team league result. The team continued in the Bristol and District League until the late 1980s and in1991/92 joined the Premier Division of the Premier Combination, winning the GFA Senior Amateur Cup in promotion to the Gloucestershire County League 1994/5 then the Western League in 1996/7, the Western League Premier League in 2003/4, becoming championship winners and GFA Trophy winners in the 2008/9 season. Other temporary, unsavoury terms were used to describe the supporters and the players. In the 1920s a player from local rivals Keynsham called them ‘Vicious Lions’ and in 1924 four Bitton fans were arrested at the local derby on Keynsham’s ground. The original football changing rooms at the rec was an old nissan hut obtained from Salisbury Plain and floodlights were added in 2001. Bitton’s football history added a new dimension when a ladies team was formed in 2007/8, which runs alongside the clubs youth teams. The parish has also been represented at lower, but no less important, standard of football by various teams: The Home Guard team in the 1940s and, from North Common, Poplar Rovers a well known team in the 1920/30s playing in the field next to Busley’s Farm. The players changed in an outhouse which they had to clean themselves after the game. Their kit was washed by Elsie Connat in an old tin bath. David Noble’s above mentioned book has photos of the 1939/40 Home Guard team including goalie W Gray, E Brain and G Lucas and the Poplar Rovers teams of 1921/22, 1933/34 and 1949/50 which includes trainer Grant Elston and mascot Dave Saunders. Brockham Hill Rangers1918-23 had the Queenshead at Willsbridge as their headquarters playing in the common field behind the pub, changing in an old disused slaughterhouse. More recently schools’ football left its mark historically when Sir Bernard Lovell School won the coveted Woodcock Shield in the 1991-2 competition. The Western Daily Press and Bristol Mercury hold various interesting references to both Bitton AFC and Oldland: Bristol and District League December 1901 shows Oldland in Division 2 with other teams such as M C Memorial, Wills and Dominicans. November 1903 shows them still in Bristol and District League with teams such as Beaufort, Brislington, J S Fry’s and Clevedon. The July 1950 celebration supper had a guest list of 120 and included speakers ex captain L J Nicholas, Bristol City director E C J Harris, D Wake and M England. Bitton’s 15th Feb 1892 team of Monk, P Davis, H Barnes, F Prouse, J Torrance, F Lovell, W Mortimer, E Jefferies, W Cole, F Beese and A Monk lost 3-1 at home to Bristol South. While other newspaper selections include the Western Daily Press report of Saturday October 3rd 1891 Frenchay 1 v Bitton 0, 24th October Bitton 9 v Wick and Doynton 3, while Bitton Reserves beat ST Gabriels 5-2 at Eastville Park on the same day. L Homer, G Gay and F Prouse were Bitton’s scorers in a 4-0 win over Bath Reserves on Saturday 15th November 1890 (this from the Bath Chronicle). On the 21st November 1891 Bitton beat Melville 7-0 although Melville played the first half two players short but found one more player to end the game with 10 men.